Everyone's favorite space miner, Isaac Clarke, is back to cut more necromorphs to pieces in Dead Space 2. He's left the dark hallways of the spaceship Ishimura for The Sprawl, an enormous city attached to the last remaining shard of the moon of Titan. Much of Dead Space 2 will immediately look and feel familiar to fans of its predecessor. Isaac is still shambling around in environmental suits, using mining equipment to lay waste to the monstrous necromorphs that are prowling the city, popping up in nerve-jangling fashion. You'll have to "strategically dismember" the creatures to prevent them from crawling after you, though you can occasionally just cave in their heads, too. They're tough, disgusting creatures. A lot in Dead Space 2 has changed, though. Moving the action from the Ishimura to The Sprawl allows for far more environmental variety than in the original Dead Space. The demo I saw featured an icy crypt beneath the Church of Unitology as well as a deck that looked out over the vastness of the city. The visuals were marvelous and vibrant and The Sprawl's varied locations, like schools and shopping malls, should allow for all manner of deadly situations. My one concern is that it all might start feeling a bit too ordinary. Part of what made the first Dead Space special was right there in the title - Space. Will a shopping mall in space retain that unique feel, or will we just feel like we're playing any old horror game? Hard to say at the moment. While you'll still encounter zero-G environments, you'll now have full 360 degree flight capabilities, as opposed to just picking a direction and letting your magnetic boots do the rest. You can also now cut a limb off a necromorph and fling it back at them to save ammo - particularly effective when you're up against something with huge, spiky arms. 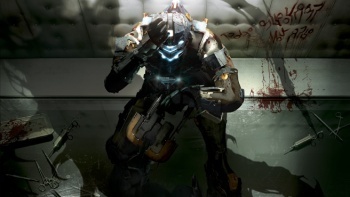 Dead Space 2 will also offer more puzzle-type situations that will make sense in context. The one puzzle I saw had to do with moving mechanical arms to stop the spinning wheels of a device that bore a strong resemblance to the engine in Event Horizon. Nothing particularly brain-breaking, but a nice diversion from blowing monsters into goo. Speaking of goo, the puker joins the necromorph ranks, hurling its spew with disgusting abandon. Ever seen space vomit travel in slow motion? You will. Perhaps the biggest change in Dead Space 2 is that Isaac now has a face and a voice. He's no longer your silent avatar stand-in, but rather a genuine, fleshed-out character. I'm not entirely convinced this is a good thing - Isaac's silence was part of what made the first game scary for me - but I didn't see nearly enough to form any real opinion. The demo I saw was meant to showcase new weapons and monsters, and only had a few lines of dialog. Dead Space 2 will have more weapons, enemies, suits, and locations than its predecessor, all of which should make it a very enjoyable action game. Will it be scary? That I'm not so sure about. Nothing in the demo I saw was particularly creepy. Being swarmed by a pack of necromorphic children was tense and exciting, but not really all that scary. I'm hoping that's less a fault of the game and more just a reaction to my surroundings, though. I wasn't actually the one manning the controls, was in a large group of people, and didn't have any real context for what was going on in the game; not exactly the ideal scenario for being frightened. If you didn't find the first Dead Space scary, then just content yourself with the fact that the sequel should improve nicely on the original. If, like me, you're hoping to be scared, too, you may have to wait and see. Dead Space 2 is scheduled for release on January 25, 2011.